Idag den 29 december, vid lunchtid denna vinterdag då det är minusgrader i hela landet, så är den SAMLADE EFFEKTEN FRÅN DE SVENSKA VINDKRAFTVERKEN NERE PÅ 3 %. Jag säger bara en sak – tack Gode Gud för denna pålitliga och säkra energiförsörjning! 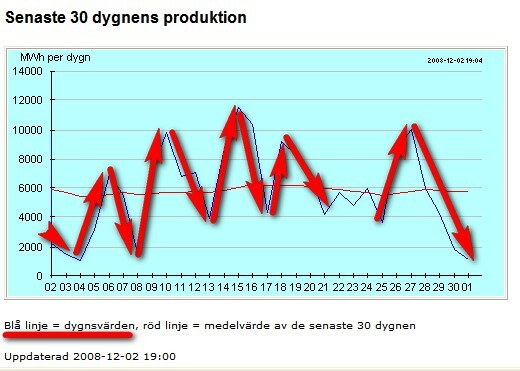 Den 22/12 så var produktionen drygt 11000 MWh per dygn. 2, jag säger 2 dagar senare så var den drygt 1800 MWh per dygn! EN MINSKNING AV PRODUKTIONEN PÅ DRYGT 84 %! Christopher Horner talks about his book, The Politically Incorrect Guide to Global Warming and Environmentalism. Global warming is a scare tactic designed to increase governmental power and control. Vill ta tillfället i akt att önska all mina läsare en riktigt God Jul och ett Gott Nytt År. De närmaste två veckorna som kommer jag bara sporadiskt att publicera inlägg. Jag ser med förtröstan fram mot 2009. Det år då den största politiska och vetenskapliga skandalen i modern tid kommer att spricka – Global Warming hysterin. I would like to take this opportunity to wish all my readers a Merry Christmas and a Happy New Year! The next two weeks I am only going to publish post sporadically. I am looking forward to 2009, the year when the biggest political and scientific scandal in modern time is going to implode – The Global Warming Hysteria. Här kommer en intressant artikel från Richard Littlejohn, The Daily Mail. From the New York Times, December 12: Soviet scientists on board an icebreaker drifting just 300 miles from the North Pole have concluded that the world is getting hotter. Warm-water fish are appearing in increasing numbers in Arctic seas as temperatures have risen, melting the ice caps. The Russian explorers believe that very soon ships will be able to sail right across the Pole. This news will be welcomed by ‘global warming’ campaigners – except that it first appeared on December 12, 1938, and has just been republished on a website run by a former TV meteorologist, who treats the whole ‘climate change’ racket with a healthy dose of sea salt. The Soviet scientists also concluded that the warmer weather was almost certainly down to the rays of the sun. And they added it would be rash to prophesy the duration of these higher temperatures, since the Ice Age was followed immediately by a period of much hotter summers than they were experiencing in the Thirties – the warmest decade of the 20th century, as it turned out. A few short years later, by 1947, the ice caps were restored to their former glory and Britain experienced one of the harshest winters on record, lasting well into March. We’re going through another one this year. November was the coldest for three decades. We even had snow in October, on the day the Commons was debating its ludicrous, self-important ‘climate change’ bill. That was the same month China‘s official news agency reported that Tibet had suffered its ‘worst snowfall ever’. Across the world, temperatures have plummeted. There was snow in Las Vegas this week. Much of North America has been hit by an ice-storm. In Canada, there’s 30 per cent more ice than last year and the polar bears, who are supposed to be on the brink of extinction, are breeding at an alarming rate. None of this has in any way deterred the ‘global warming’ fascists. They dismiss this glaring, incontrovertible evidence as a ‘blip’ and continue to insist the world is burning up. Never mind fourteen years, we’re talking about the coldest winter in 30 years. And still they won’t admit to even a smidgeon of doubt about the wilder excesses of their scaremongering. Whenever they are presented with evidence which contradicts their world view, they either ignore it or fiddle the figures to pretend it doesn’t exist. When temperatures hit the 90s in August, it’s proof of ‘global warming’. When they drop below zero in October, that’s down to ‘climate change’. Nay-sayers are portrayed as deranged bay-bee killers and dismissed as ‘deniers’ – an offensive slander designed to equate sceptics with those nutters who insist the Holocaust didn’t happen. That’s because this isn’t about the planet, it’s all about them. ‘Global warming’ gives them a reason to believe, provides meaning and purpose to their dismal little lives. As the wise old G.K. Chesterton observed, when people stop believing in God, they don’t believe in nothing – they believe in anything. In an increasingly secular Britain, ‘climate change’ is the new religion. You don’t get much fuss about ‘global warming’ in the Islamic world. [A personal note here – This is a very good point. I have been following the Arabic press on and off for a long time, not the English version with is for ”external” consumption by the west, but the ”internal” one. And there is zip, nada, niente talk about how they are going to ”cope” with Global Warming, ”change” their lifestyle and cut down on consumption etc. And it’s no coincidence that so many of those most active in the great ‘global warming’ crusade used to sign up to communism and the more extreme, headbanging fringes of Far Left politics. Mainstream politicians clamber on the solar-powered bandwagon because it allows them to posture as self-righteous friends of the Earth, while giving them licence to raise taxes, spend public money and impose ever tighter controls on the population as a whole. In Britain, that translates into dearer petrol and scrapping weekly rubbish collections, backed by an exciting new range of fines and punishments. It also justifies a giant job creation scheme for Guardian readers. It’s about power, not saving the planet. The central conceit is that everything which happens on Earth revolves around them and that they are the only people who can fix it. They tend to overlook the fact that the Earth managed perfectly well for millions of years before they were born and will manage quite nicely millions of years after they are gone. They deliberately confuse pollution with ‘climate change’. Of course we need to find alternative energy supplies and reduce emissions where we can. But that shouldn’t mean regulating the world back to the Stone Age. And as for the great ‘carbon’ con, hasn’t anyone noticed that plants and trees live on CO2? If Arthur Daley was around today, he’d be running a carbon trading scheme out of his lock-up in Acton. Del Boy Trotter would be selling carbon offsetting forms from a suitcase on Peckham market. When it comes to tackling pollution, the Mail’s campaign against plastic bags has done more for the environment than any crackpot scheme dreamed up by bureaucrats. Needless to say, the BBC has bought into the ‘climate change’ scam lock, stock and windmill. Have you noticed how, whenever there’s a story about ‘global warming’ it’s usually accompanied by that film of a polar bear stranded on a ice floe? It’s the same bear, time and again, just like they used to replay endlessly the same footage of that one mad cow during the BSE fiasco. Incidentally, back in 1938, they weren’t so sentimental about polar bears. The New York Times reported that whenever the Soviet expedition came across a polar bear, they shot it for food. Given that we are told ‘global warming’ presents such an ominous threat to agriculture, and the exhaust gases of cattle contribute greatly to the non-existent hole in the ozone layer, maybe we should start farming polar bears. That would save them from extinction. I wonder if I could get a grant for it. This 1 1/2 year-old video of Dennis Miller’s rant about global warming on his segment called ”The Buck Starts Here”. Hey folks, tonight I wanna talk about global warming. Now, The World is Flat and Hot Society is growing increasingly hysterical and that indeed is causing me to sweat a little. Global warming is officially becoming creepy and I can’t tell yet if it’s fascistic or fetishistic but it’s kinda like piercing or tattoos, I don’t even wanna get one, because I see how hooked people are and it spooks me. I just find it odd that we’ve come to a point in history where if I don’t concede that Manhattan will be completely submerged in 2057 I’m thought to be a delusional contrarian by some of my more zealous fellow citizens. I’m sorry Angst Squad, but if we commissioned a public works project (let’s call it ‘The Manhattan Project’) and tried our hardest to submerge Manhattan in the next 50 years, we couldn’t pull it off, mainly because it wouldn’t be environmentally sound and you guys would hang it up in the permitting process. Simply put, I can’t worry about the earth right now because I’m too worried about the world. Why can’t I take terrorism as seriously as Al Gore takes global warming? There are times that you think that liberals only fear car bombs if they have leaky exhaust systems. And why am I constantly beaten over the head with ‘the delicate balance of nature’? Am I the only one who watches Animal Planet? Every time I turn it on, I see some demented harp seal chucking penguins down his gullet like they were maitre d’Tic-Tacs. To me, nature always appears more unbalanced than Gary Busey with a clogged Eustachian tube. Listen, the weather is just like Hillary’s explanation for her war vote: we just don’t know, do we? We’re here to miss our next Tuesday’s weather much less the year 2057. Relax, we’ll replace oil when we need to. American ingenuity will kick in and the next great fortune will be made. It’s not pretty, but it is historically accurate. We need to run out of oil first. That’s why I drive an SUV: so we run out of it more quickly. I consider myself at the vanguard of the environmental movement and I think the individuals who insist on driving hybrids are just prolonging our dilemma and I think that’s just selfish. Come on, don’t you care about our Mother Earth? Don’t cha? We have identified an ecological disaster and HUMANS ARE TO BLAME. But if you pay us lots of money and do exactly what we say, we may be able to fix it in time. Well, even if we’re wrong, you still ought to pay us lots of money and do exactly what we say. OK. So nothing is happening and there isn’t any evidence, but there will be soon if you don’t PAY US THE MONEY! c. they had the balls to do their own dirty work. ”En klassisk kontrollmekanism i form av efterhandsunderrättelse till den som utsatts har införts, men sådan rätt gäller bara ekonomiska brottslingar, narkotikalangare samt klassiska våldsbrottslingar som medlemmar i Original Gangsters, Hells Angels och motsvarande. Nu har det snart gått ett år sedan Registernämnden avskaffades och ersattes med en ny Säkerhets- och Integritetsskyddsnämnd. När både bloggvärlden och den riktiga världen skrikit sig hesa i FRA-debatten har det varit påfallande tyst kring denna tragedi, skriver Dennis Töllborg, professor i rättsvetenskap vif Göteborgs Universitet. Något säger detta om vårt land. Inom den nationellt inriktade säkerhets- och underrättelsetjänsten i Sverige är nämligen empirin otvetydig: de olika kontrollorgan som skapats har, med reservation för just Registernämnden när den stod under Carl-Anton Spaks ledning, havererat med åtföljande till sitt innehåll närmast tröttsamma skandaler. Man har nog haft rätt att förvänta sig att den beramade Säkerhetstjänstkommissionen, med dess medvetet och medialt starka framhävande av påstådd forskarkompetens i kommissionen, skulle ha lyft just detta som en centralt avgörande, närmast strukturell, förklaringsmodell. Istället inte ett ord. Ändå hade, i all den kritik som har riktats svenskt säkerhetsskydd, en sak framträtt som totalt otvistig: kontrollorganen hade totalt havererat. Mot den bakgrunden framstod det redan 1996 – långt före säkerhetstjänstkommissionen ens var påtänkt – skapade nya kontrollorganet, Registernämnden, som en nödvändig innovation. Registernämndens verksamhet var i allt väsentligt en verklig ”success story”, och något Sverige med viss grad av stolthet kunnat lyfta fram även i internationella sammanhang. Som så vanligt berodde framgången naturligtvis inte så mycket på konstruktionen som på vilka människor som satt i den. Framförallt var nämndens första ordförande Anton Spaak och vice ordföranden Jan Öhman centrala i förbättringen av kvalitén i Säkerhetspolisens verksamhet, såväl avseende rättssäkerheten för de kontrollerade som för säkerhetspolisen eget arbete. Det var därför ägnat att oroa när den dåvarande socialdemokratiska regeringen körde över Spaak, som försökt skapa kontinuitet genom att se till att Öhman blev vice ordförande och således nämndens framtida ordförande in spe, och istället utsåg ny ordförande utan varken kompetens eller ambition på området. Öhman lämnade nämnden, men dessa markeringar var i vart fall tillräckligt starka för att nämndens övriga ledamöter skulle se till att praxis tills vidare bestod. I juni 2006 förlorade Sverige med sju röster mot noll på hela fyra artiklar i Europadomstolen. Målet kom ur den nationella vrede som drabbade makthavarna, när innehållet i Leanderakten avslöjades, och tusentals människor krävde att få läsa sin akt och få upprättelse. Europadomstolens dom var en närmast förödande slakt. I ett fungerande system skulle Sverige naturligtvis ha gjort de förbättringar av systemet som domen krävde, något många utanför maktens korridorer tror också skedde. Så blev det inte. Istället rev man ned hela systemet, avskaffade Registernämnden och införde istället – parallellt med att man tillåtit buggning, utökad telefonkontroll, skyddade identiteter – per den 1 januari 2008 ett helt nytt organ: Säkerhets- och Integritetsskyddsnämnden (SIN). Som ordförande utsåg man Anders Eriksson, den f d chef för Säkerhetspolisen som tvingats lämna sitt uppdrag när det endast återstod några månader av hans sexårsförordnande. I vilket annat land hade man kunnat utse en tidigare chef för en verksamhet som under hans ämbetsperiod systematiskt ignorerat till och med grundlagen till vår främste garant för att inget otillbörligt sker – utan att det blivit ett ramaskri i landet? 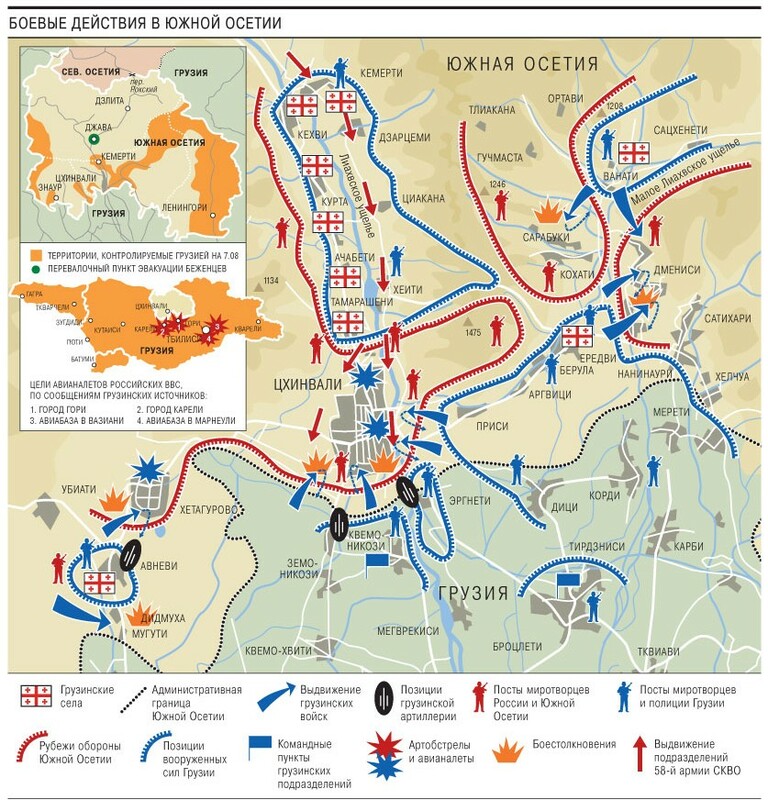 Historien upprepar sig alltid – det är den dumma mänsklighetens förbannelse. Till nämnden fogar man, på sätt som vi hade med lekmannaledamöterna i den katastrofala styrelse för Rikspolisstyrelsen som föregick Registernämnden, således återigen parlamentariker. Kvalitén på de nyutnämnda ledamöterna skiftar säkert, liksom ambitionsnivån, men det är belysande att när man frågar landets största parti, socialdemokraterna, vilken de utsett till representant i den nya nämnden så är svaret att ”frågan bör du nog ställa till politikerna i din kommun om det är en kommunal nämnd du menar” – partiet är inte ens medvetet om att nämnden finns, att den gäller riket, är inrättad efter beslut av riksdagen och att partiet själv fått rätt att nominera en ledamot! a) Buggning tillåts(SFS 2007:978). Lagen är tidsbegränsad till 2010, men vi har sedan den så kallade Enbomslagen, 1952, aldrig sett att en sådan tidsbegränsad lag inte förlängts. Buggning får bara ske när det påstås att det är för att avslöja brott som kan föranleda minst fyra års fängelse, det får inte ske på läkarmottagningar, advokatkontor eller hos medieredaktioner (men väl i professor Dennis Töllborgs tjänsterum, liksom i hans sovrum). Samtidigt förstärks sekretessen, till skydd för ”det öppna samhället” får vi väl anta. Allting sker ju trots allt alltid i det godas namn. Således förlängs återigen Enbomslagen, därtill utvidgas och förlängs denna gång med hela fyra år. Att det hela sker lagenligt ska alltså bevakas av den nyinrättade Säkerhets- och integritetsskyddsnämnden, med Anders Eriksson i spetsen, och såvitt avser militären alltjämt av Försvarets Underrättelsenämnd (FUN), med Anders Björk i spetsen (ni minns mannen vars enda reaktion på att underrättelsetjänsten illegalt satt en bugg i sängbenet hos en kvinna, var att offentliggöra kvinnans namn och skrattande berätta att allt man fick fram ”var lite flåsande”). En klassisk kontrollmekanism i form av efterhandsunderrättelse till den som utsatts har införts, men sådan rätt gäller bara ekonomiska brottslingar, narkotikalangare samt klassiska våldsbrottslingar som medlemmar i Original Gangsters, Hells Angels och motsvarande. Den som utsätts för hemlig telefonavlyssning, buggning eller vad det månde vara av säkerhetspolisen saknar motsvarande rättigheter som nu tillförsäkrats de som utför den typ av vardagsbrott som är genuint systemhotande. Någon tröst är det väl att frågan om den som utsatts för övergrepp ska få skadestånd eller ej, ska avgöras av vänsterns nye hjälte, Göran Lambertz. Det betyder ju, om man ska följa de avgörande han hittills tagit vid övergrepp från Säkerhetspolisens sida, att skattebetalarna inte behöver oroa sig för att statens utgifter ökar. Network’s second meteorologist to challenge notion man can alter climate. CNN Meteorologist Chad Myers had never bought into the notion that man can alter the climate and the Vegas snowstorm didn’t impact his opinion. Myers, an American Meteorological Society certified meteorologist, explained on CNN’s Dec. 18 ”Lou Dobbs Tonight” that the whole idea is arrogant and mankind was in danger of dying from other natural events more so than global warming. ”We have 100 years worth of data, not millions of years that the world’s been around,” Myers continued. Dr. Jay Lehr, an expert on environmental policy, told ”Lou Dobbs Tonight” viewers you can detect subtle patterns over recorded history, but that dates back to the 13th Century. Another CNN meteorologist attacked the concept that man is somehow responsible for changes in climate last year. Rob Marciano charged Al Gore’s 2006 movie, ”An Inconvenient Truth,” had some inaccuracies. Och bergochdalbanan fortsätter – Upp och Ner, Upp och Ner. Jojo el vore ett bättre namn än det ”gröna miljövänliga” alternativet. Och HELA 9 % samlad effekt en vinterkväll som denna. And you can hardly blame the humans this time! CAPE CANAVERAL, Florida (Reuters) – NASA is still unable to say for sure whether its Phoenix lander has found a place where life could have existed on Mars. But scientists working with the U.S. space agency said on Monday computer models they have been using to predict what the weather would be like on the Red Planet are wrong, and more accurate models would give a better picture of its past. Speaking at the opening day of the American Geophysical Union conference in San Francisco, Phoenix mission scientists laid out the early harvest from five months of robotic operations on the northern polar region of Mars. In addition to analyzing ice and soil samples for organic material, a process that is still under way, the Phoenix science team collected daily weather reports, information considered critical to learning if the planet could have supported water long enough for life to evolve. Phoenix saw dusty summer days slip into cloudy fall, replete with ground fog, snow and frost. More accurate computer models would give scientists a clearer picture of what happened in Mars’ past, particularly when the planet’s axial tilt, or obliquity, was greater than it is now. Without a large moon for stabilization, Mars’ polar regions periodically shift off axis by more than 35 degrees. During those times, the sun would rise higher in the sky above the Martian poles, making for warmer summers. Scientists are trying to determine if there was ever a period of time when it would have been warm enough for water, considered a key ingredient for life as we know it. ”We’re really trying to understand if this was ever a wetter environment,” Smith said. The Phoenix team also is on the hunt for evidence of minerals affected by water. Scientists had problems delivering soil samples into Phoenix’s tiny ovens for analysis because the soil turned out to be rather clumpy, not dry and dusty like the soil at sites where other probes have landed. Though frustrating, the discovery also spurred new questions about how water is moving through the ice, soil and atmosphere. ”Something is taking the wind-blown material and mildly cementing it,” said Ray Arvidson, of Washington University in St. Louis, who served as the lead scientist for the lander’s robotic arm. More results from the Phoenix mission are expected next year. Clinton-Gore behind the Global Warming! Jag skulle vilja säga att den här grafen är mera vetenskaplig än IPCC:s och Manns ”hockey stick”. Så med IPCC: s ”vetenskapliga” logik har vi alltså bevisat att President Clinton och vice president AL Gore ligger bakom den globala uppvärmningen och ökningen av temperaturen under 1990 talet. Och inte CO2. Det är väl därför Al Gore är ute och missionerar och sprider sin skräck propaganda – han har helt enkelt dåligt samvete för vad han har åstadkommit! Nå, han har ju tjänar massor med pengar på det hela så synd om honom är det inte. Hur våra politiska partier har sålt ut ALLT vad fri- och rättigheter heter! Datalagringsdirektiv, Telekompaket, ACTA, IPRED, IPRED2, FRA1 och FRA 2…..
Läs och förskräcks över hur våra politiker i allt snabbare takt överger och säljer ut VÅRA fri- och rättigheter. Och de har mage att påstå att de gör det för att skydda OSS. VAD VI VERKLIGEN BEHÖVER SKYDD FRÅN ÄR ALLA POLITIKER OCH POLITISKA PARTIER SOM HAR ÖVERGETT SINA PARTIPROGRAM OCH SINA IDEOLOGIER! Och lägg märke till att detta har ingenting med ”höger” eller ”vänster” att göra. Eller med ”sossar” kontra ”moderater” att göra. MOT våra s.k. ”folkvalda” politiker som vill införa dessa mycket långtgående inskränkningar i svenska folkets fri- och rättigheter. Och som en extra förolämpning – Det sker i ”Vårt Namn” och för att ”skydda oss”. Vad vi VERKLIGEN behöver skyddas emot är den politiska elitens nya klassificering av sina egna medborgare som ”opålitliga” och ”potentiella brottslingar”! Som bara kan ”bevisa” sin oskuld genom att ”snällt” finna sig i en total MASSÖVERVAKNING och MASSAVLYSSNING. En total pervertering av den rättsordning som gällt de senatse århundradena – Dvs. att du är OSKYLDIG TILLS NÅGOT ANNAT ÄR BEVISAT BORTOM ALLA RIMLIGA TVIVEL! Enligt telekombolagens eget branschorgan, IT & Telekomföretagen, så är kostnaderna 4 000 kronor per hushåll. OCH DÅ ÄR INTE KOSTNADERNA FÖR IPRED LAGEN MEDRÄKNADE. INGET av de borgerliga partierna hade någon av dessa punkter på sitt valprogram 2006. Tvärtom – de skrev och pratade vitt och brett hur de ville stärka våra fri- och rättigheter och värna och stärka skyddet för vår personliga integritet. Jo tack vi har sett vad det betyder i praktiken! Det finns med andra ord inget som helst mandat från väljarna att genomföra dessa åtgärder. Det är ingen djärv gissning att en allt större del av framtidens kamp för friheten kommer att röra de klassiska frågorna om rätten att fritt få sprida och ta del av information. Vi ser redan i dag hur i vissa länder bloggarna förföljs, servrar stängs ner, internetsidor censureras eller tillgången till datorer begränsas. Här ska Sverige stå i främsta ledet för att slå vakt om informationsfriheten. Jag har därför i dag satt igång ett arbete inom UD att inför det svenska ordförandeskapet ta fram förslag om hur Sverige kan verka för att stärka Europeiska unionens insatser till försvar för yttrande- och informationsfriheten på internet. Detta som en blygsam men ändå födelsedagspresent till en hyggligt vital 60-åring”. Detta skriver alltså Carl Bildt som sitter i den nuvarande regeringen som har drivit igenom FRA1 och FRA2 med piska och fysisk och psykiska mobbing av de riksdagsledamöter som protesterade och hade invändningar. Carl Bildt körde ju för övrigt med den ”käcka” slogan ”Fri med FRA” på sin blogg där han ivrigt försvarade FRA lagen. Och som nu i FULL FART håller på att genomföra Datalagringsdirektiv, Telekompaket, ACTA, IPRED etc. ALLT DETTA i OPPOSITION MOT SINA EGNA UNGDOMSFÖRBUND, LOKALA PARTIORGANISATIONER OCH MEDLEMMAR. För att inte nämna Advokatsamfundet och Sveriges jurister, Journalistförbundet, SÄPO, Justitiedepartementet, Rikspolisstyrelsen för att bara nämna några som protesterade. För att inte tala om majoriteten av svenska folket. Till saken hör också att regeringen kör med kollektivt beslutsfattande – Dvs. ALLA statsråd är ansvariga för alla beslut. Beslut som tas i enighet. Jag tror INTE att det var MASSÖVERVAKNING och MASSAVLYSSNING som FN:s deklaration om de mänskliga rättigheterna avsåg. Och jag tror ganska bestämt att denna 60 åring betackar sig för denna typ av ”presenter”. Det som blir extra ironiskt är att Carl Bild utsatte Fredrik Reinfeldt för samma fysiska och psykiska mobbing i februari 1995. Alltså samma typ av ”avrättning” som Fredrik Reinfeldt utsatte Karl Sigfrid för i juni i år. ” Sigfrid själv svarar bara att han inte orkade ”igenom processen utan blev utkvittad”. Karl Sigfrid sitter i ett skruvstäd. Han har varit illojal mot partiledningen genom att hota att rösta nej. Att berätta om hur de fick honom att ändra sig skulle vara att bryta mot ännu en hederskodex. Men det finns andra som har beskrivit hur det kan gå till på moderata gruppmöten, när partiledaren har utmanats. ”Hans teknik är att först skälla ut mig en timme och sedan ska alla ­andra hålla med. Ingen får gå hem förrän det skrikits färdigt på mig”. Det tog flera år innan Fredrik Reinfeldt bröt tystnaden om det här mötet i riksdagsgruppen för 13 år sedan, ­våren 1995. Skälet till urladdningen var att den unge Reinfeldt hade skrivit en bok om valförlusten som innehöll kritik mot Carl Bildt. Partiledaren visade inför hela riksdagsgruppen att han inte uppskattade initiativet. ”Någon försöker invända att de inte förstår syftet med en sådan här avrättning. Men det hjälper inte. Carl bara fortsätter” har Fredrik Reinfeldt berättat. ”Jag kände mig otroligt kränkt” är hans sammanfattning av känslan ­efter mötet med Bildt och riksdagsgruppen. Jag känner bara för att kräkas över detta ovärdiga taskspeleri från våra politiker med våra fri- och rättigheter! Och bara för att förstärka denna bild av total maktarrogans så har idag regeringen publicerat ”Viktigare lagar & förordningar inför årsskiftet 2008/2009”. ”Signalspaning i försvarsunderrättelseverksamhet lagregleras för förstärkt integritetsskydd”. Jäpp – Massavlysning innebär ”förstärkt integritetsskydd” enligt detta orwellianska nyspråk (Newspeak). Den länksamling och artiklar som följer är bara ett litet urval. ”Någonstans på vägen har vårt samhälle gått från representativ demokrati till repressiv politik. Spärren för det otänkbara har filats ner och flodportarna är nu öppnade. ”Att Ipred-lagens bestämmelser därmed ger upphovsrättsinnehavarna större befogenheter än vad polisen har, eftersom polisen bara får göra husrannsakningar om det finns fängelse i straffskalan, menar Rickardsson är medvetet nedtystat i debatten. ”Av Per Sundins svar på frågorna framgår det att upphovsrättsindustrin inte är intresserade av att hitta den som faktiskt gjort sig skyldig till upphovsrättsintrång. Upphovsrättsindustrin är bara intresserad av att hitta någon de kan skicka ett kravbrev till. I detta fall innehavaren av internetabonnemanget oavsett om denna råkar vara skyldig eller oskyldig. Detta görs redan idag i bl.a. England och Danmark. Detta synsätt framgår också klart och tydligt i förarbeten till den föreslagna lagstiftningen. I lagrådsremissen står det ”Det krävs däremot inte att den som har gjort intrånget eller överträdelsen är identifierad. Det krävs inte heller att intrånget eller överträdelsen har begåtts uppsåtligen eller av oaktsamhet”. Alltså finns det inget krav på att innehavaren av abonnemanget skall ha gjort sig skyldig till den olagliga fildelningen för att uppgifterna skall lämnas ut. Min sambo som står för vårt internet har inget uppsåt och min ”osmarta” granne, han med det trådlösa nätverket, skyddade sitt nätverk med WEP-kryptering, som jag forcerade på ett par minuter, har inte varit oaktsam men skyldig ändå. ”Lagringskostnaderna för den gigantiska informationsmängd som det är fråga om har uppskattats till 200 miljoner kronor de första åren. En kostnad som kallt föreslås vältras över på operatörerna. Jovisst, de ska kompenseras av staten med 20 miljoner kronor. Men gissa vem som får stå för resten? ”Det finns också en oro för att den nya lagen ska kunna användas för helt andra syften än riksdagen har tänkt sig. Den skulle till exempel kunna användas av religiösa sekter eller politiska extremgrupper som kan hävda att någonting fildelats illegalt från deras hemsida. – Den risken är påtaglig. Dessutom kan man gå till någon annan för att få en kartläggning gjord. Och via nätet är du väldigt sårbar, säger Stefan B Grinneby, chef för Sitic, Sveriges IT-incidentcentrum, en specialenhet under Post- och telestyrelsen. ”Representanter för regeringen och de borgerliga partierna försöker få folk att tro att EU tvingar Sverige att införa den så kallade piratjägarlagen. Det är fel. Det är medvetet vilseledande – så till den milda grad att det kan kallas direkt lögnaktigt. Till och med många inom gammelmedia har gått på denna bluff. IPED1 är ett EU-direktiv som gäller fler saker än piratjägarlagen. I det stora hela måste Sverige införliva detta direktiv i svensk lagstiftning, ja. Men EG-domstolen säger uttryckligen att medlemsstaterna inte behöver genomföra den del av direktivet som handlar om piratjägarlagen! Då går vi vidare i läsningen av IPRED lagen. Nu är det dags för § 55 i lagen om upphovsrätt (1960:729). I denna paragraf skapar man möjlighet till bokbål och att bränna elektroniska kopior av cd:ar. Om det passar dåligt kan man radera hårddisken. Det kan man till nöds förstå. Det som är allvarligare är att upphovsrättsinnehavaren kan få rätt att förstöra ”hjälpmedel” som man använt för ”brottet” mot upphovsrätten. Inte nog med det”hjälpmedel” som man tänkt (förberedelse eller försök) använda för ett ”upphovsrättsbrott” kan också förstöras. Byggnader får inte förstöras. Det var väl tur! ”Men aldrig att jag anade hur jag själv skulle komma att ställas inför detta mardrömsliknande scenario. Aldrig. Jag som är född och uppvuxen i världens tryggaste land, i toppen av välfärdspyramiden, har börjat inse att precis vad som helst kan hända. Inte bara i romanens värld, utan i min egen. Det är FRA, Ipred och nu datalagringsdirektivet. Jag måste säga att jag skälver. Hur kan det komma sig att jag, den lilla människan på den här delen av klotet, numer inte har den svenska statens förtroende längre. Jag är inte särskilt kriminell, jag har aldrig varit det. Men ändå kommer allting som jag fortsättningsvis företar mig via telefon och dator att lagras utifall, liksom. Till och med om jag skulle råka slå ett nummer felaktigt till någon möjligtvis lite suspekt person, så kan det hända att jag därefter ganska omgående får mina eventuella tillgångar frysta och mitt hem genomsökt, av människor jag aldrig tidigare träffat. ”- Det här är ett oerhört stort ingrepp i den personliga integriteten. Det är ett paradigmskifte att börja övervaka och registrera människor som inte är misstänkta för brott, säger till exempel Sveriges advokatsamfunds generalsekreterare Anne Ramberg till SvD. Hon kallar lagen ”häpnadsväckande” och menar att den riskerar att bryta mot både den svenska regeringsformen och Europakonventionen. ”Spärrade bankkonton, och upphovsrättsinnehavare som får göra husrannsakan och tillgång till medborgares privata kommunikation, och tvinga oskyldigt anklagade att bevisa sin oskuld – man baxnar. Allt för kulturens skull, sägs det, för skador som både KTH och Harvard konstaterat inte existerar. Vad svenska folket anser om upphovsrättsintrång som anledning till denna form av lagstiftning verkar vara tydlig nog enligt en undersökning beställd av TV4. Man undrar nästan om de etablerade partierna VILL få in piratpartiet i riksdagen. ”I paragraf §53b inför regeringen möjlighet att lagföra någon när det gäller ”fråga om försök” eller ”förbereder intrång”. Detta är en betydande utvidgning av upphovsrätten. ”I § 53g inskränker man den enskildes rättigheter enligt personuppgiftslagen. Vilka konsekvenser det får i praktiken kräver en längre utredning. I §53h återinförs stupstocken. Den som har begått detta ”brott” eller som medverkat till ”brottet” ska bekosta information om domen i målet. Detta gäller även vid försökt till upphovsrättsbrott. Medeltidens stupstock ska uppenbarligen återinföras. FRA. Ipred. Datalagringsdirektiv. Se där tre vansinniga initiativ som i ett slag och var för sig omvandlar Sverige till en totalitär övervakningsstat där all trafik och all information övervakas av staten och där med staten sammanväxta kommersiella industrikarteller ges polisiära privilegier efter välkänt fascistiskt mönster. Varför lagra bara i ett år, eller två år? Varför inte löpa linan ut med en gång och lagra permanent och samköra systemen för alla möjliga behjärtansvärda ändamål som exempelvis kontroll av vabbande småbarnsföräldrar? Det är ju ändå ett så litet intrång i den personliga integriteten, särskilt med tanke på vilken nytta övervakningen kan göra i brottsbekämpningens namn! Speciellt finurligt är det med tanke på att snart sagt all brottslighet är att anse som ”grov” – se bara på Asks positiva syn på att göra det fundamentala ickebrottet sexköp till ett globalt brott med obligatoriskt fängelsestraff. En säpoagent i varje tropisk turistort, snart din verklighet. Jo, sexköpslagen var Ask och moderaterna emot. I oppositionsställning. De var emot datalagringsdirektivet också. De var emot en jävla massa i opposition, saker som nu genomförs, expanderas, förstärks eller vidgas ändå. I opposition kan man säga vad som helst, ungefär på samma sätt som sossar, miljömuppar och kommunister nu säger att de är emot FRA, Ipred och datalagringsdirektiv. Det är de inte. Det är från början deras förslag, förslag som rimmar positivt med deras syn på totalitär kollektivism, förslag som sammanfattas i beteckningen Bodströmsamhället. Vi ska ha detta i minnet när vi beaktar alternativen. För i verkligheten finns inte längre några alternativ. Alla är överens, övervakningssamhället ska införas, mot befolkningens vilja. Boskapen måste märkas och kontrolleras. Båda allianserna vill införa samma system och har exakt samma syn på alla frihetliga frågor. Och båda ljuger lika friskt. Men det är denna kristborgerliga alliansregim som trots allt har drivit och klubbat besluten under innevarande mandatperiod. Detta har de gjort trots att det är bland dem ett litet hopp teoretiskt stått att finna om ett försvar för frihetliga frågor. Detta hopp är sedan länge utsläckt, och kvar finns bara en fadd smak av besvikelse. Alliansregimen kommer att skriva in sig i historieböckerna som demokratins dödgrävare och den mest misslyckade regim Sverige någonsin tvingats utstå. Hur kunde det gå så här? Man kunde tro att galenskaperna skulle stanna vid FRA-frågan. Eller vid ipred-lagen. Eller vid datalagringsdirektivet. Men det stannade inte vid någon av dem, och inte heller vid den sammanlagda kombinationen av dem. Och vi har ännu bara sett början på eländet – de tre initiativen kommer att följas av än fler och än mer integritetskränkande lagar, vilka var och en bara kommer att utgöra ytterligare ett ”litet” intrång i den personliga integriteten. Integriteten nöts ned stegvis, tills dess att den är helt urholkad och upphör att existera som argument. De små stegens tyranni. Det är då kontrollen av boskapen är allestädes närvarande och total – en kamera i varje vrå, RFID-taggar på varje mojäng, heltäckande upptagning av all kommunikation, kompletta DNA-banker över befolkningens arvsmassa… science fiction-filmerna blir grym realitet. Åt var och en efter sina arvsanlag; mest produktiv och lydig vinner de materiella fördelarna. Som ett komplement till mitt inlägg European workers aren’t believers in the myth of ”green jobs.” kommer här en intressant artikel av Neil Winton, Reuters förre Science & technology korrespondent. Han skäms över medias roll i detta den största vetenskapliga och politiska skandalen i modern tid. ”The price tag by the committee’s own estimate could reach £14 billion annually but the effect would be miniscule. Climate change models show that the impact up to 2030 would mean the U.K. would help reduce the global temperature increase by about one three thousandth of a degree Celsius by the end of the century. An economic analysis would indicate that the U.K., for every pound spent, would only do about 4p (4 per cent) worth of good for the climate. By any standard, this appears to be a gigantic waste,” Lomborg said. Det är alltså fördetta som vår intälägänta politiker vill offra vanligt folks välstånd och våra länders ekonomier. I don’t believe in conspiracy theories, but maybe I should. After all, governments and politicians around the world seem united in saying CO2 emissions by humans are warming the climate and unless action is taken soon, we will all drown or fry. And yet any rational, sane or fair person examining the evidence linking humans to climate change would be amazed by the thinness, the inconclusiveness, of the evidence. Reporters like me, who as Reuters’ Science and Technology Correspondent in the 1990s had access to the world’s most impressive climate scientists, know that the balance of evidence points to there being no link between climate change and human activity. Despite this, the politicians’ zeal to save us gains momentum. President-elect Barack Obama said reducing greenhouse gas emissions will remain a central plank of his new administration’s policy. ”Few challenges facing America – and the world – are more urgent than combating climate change. The science is beyond dispute and the facts are clear. Sea levels are rising. Coastlines are shrinking. We’ve seen record drought, spreading famine, and storms that are growing stronger with each passing hurricane season,” Obama said, in a video shown to delegates at a climate conference in Poznan, Poland. The science is disputed by an array of impressive scientists. Sea levels may be rising, but at the snail’s pace we’ve seen since the end of the last ice age. Some coastlines are being eroded by tidal action, sure, but that’s got nothing to do with climate change. Even climate change alarmists have been beaten into submission by having to acknowledge that hurricanes aren’t growing stronger with each passing season, although building in likely hurricane-inflicted areas has gathered pace. I don’t know why politicians insist on doing this. The only reason I can think of is that leftist governments have run out of ammunition to justify ordering us about, as they lost all the arguments for more economic state control in the second half of the 20th century. But that doesn’t explain the pathetic cowardice of the world’s media in letting governments get away with this. Given the strength of the opposing view, you have to ask why? Is the media corrupt, dumb, just too lazy, or looking for a quiet life? You can see why the government funded BBC, riddled with a corrupt, socialist mantra, would be owned by the hand-wringing warming camp desperate to justify more reasons for governments to tell us what to do. The BBC shows with its climate change reporting that it is only interested in imposing its view on the world, not seeking to report with balance and honesty. But why would an opinion former and leader like Thomson Reuters, a news organisation which lives or dies by its ability to report the untarnished truth with balance and fairness (my 33 years at Reuters gives me some insight into this), go along with this corrupt, one-sided version of events? I haven’t read all its reports recently on the environment, but the ones that I have show a complete surrender to the conventional wisdom. Not even a tacit admission in its reporting that there might be some other view that should be mentioned in passing. It’s not just the Reuters newsroom which does this. The company, now Thomson Reuters, finances an educational facility which seeks to expose reporters from the less developed world to the rigours of Reuters’ news methods. This is undoubtedly a great thing to do, except for one thing. Reuters refuses to take on board in its lectures on climate change reporting that there is an alternative view that needs to be aired. We’ve had a correspondence recently on this, in which I said the following (in part). ”You say that 97 per cent of the world’s scientists accept anthropomorphic global warming. I’m not sure where you get that figure; 97 per cent of exactly what? I can point you towards scores of top climate scientists, led by MIT’s Professor Richard Lindzen or Professor Patrick Michaels of the Cato Institute who say there is not a proven link between human activity and climate change. If you take a look at the website published by Dr Fred Singer’s Science and Environment Policy Project in the U.S. (www.sepp.org) and take in its weekly newsletter TWTW, you can’t fail to be impressed and amazed at the global reach, the depth and breadth of the highly qualified scientists who doubt the link between carbon dioxide (CO2) and global warming. Read this and you will be convinced that the issue is far from done and dusted. It is true that many of the world’s biggest companies are cranking up climate change schemes. This is possibly because they can see a huge money-making opportunity in Kyoto treaty-inspired activities like Carbon Trading, which many see as a scam to raise taxes, with little impact on climate. Why would they challenge dodgy science if it was likely to curtail their business? Yes, things have moved on since the 1990s. 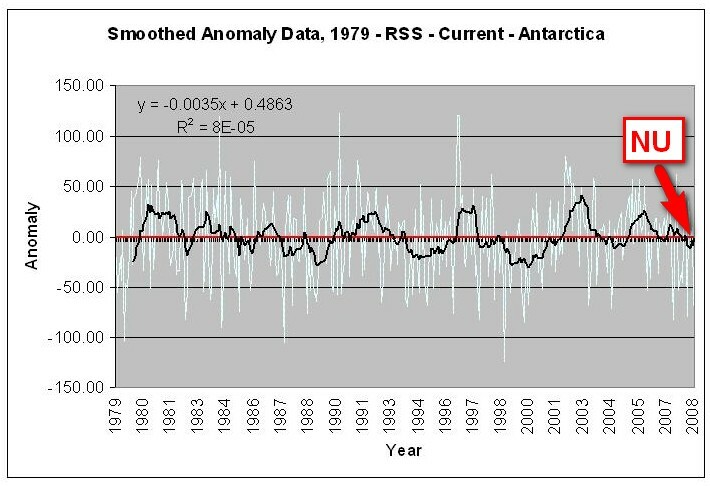 We now know that global temperatures stopped rising in 1998 and have fallen since. We know that the computer models used by the IPCC (U.N.’s Intergovernmental Panel on Climate Change) didn’t pick this up. We now know that the warmest years in the 20th century were in the 1930s, not the 1990s. We know that from the early 1940s to the late 1970s, CO2 output accelerated steadily, but temperatures fell. We have seen the deliberate faking of evidence, the most egregious being the IPCC ”hockey stick” graph, which purported to show that there was no medieval warming period, and that all the heating came recently. 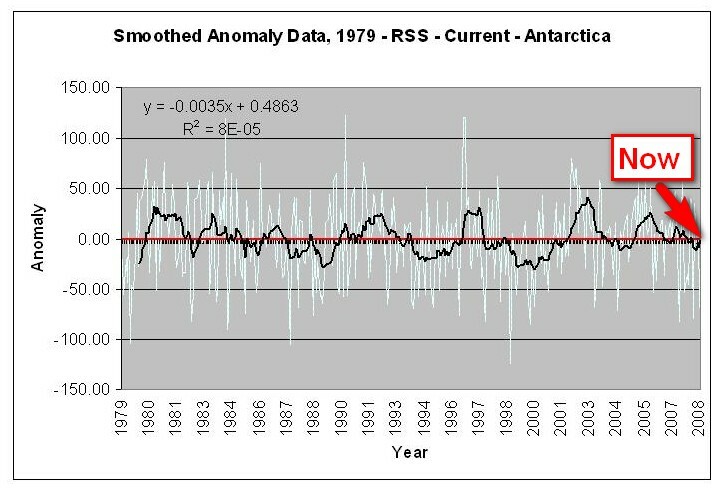 This was achieved by putting data into the computer software to make sure the right result was achieved. This has now been withdrawn by the IPCC. Al Gore’s movie ”An Inconvenient Truth” has been comprehensively shot down as a collection of half-truths and dodgy extrapolations, even though it is still being distributed in schools as the gospel truth. Nicholas Stern’s report, far from pointing the way to sensible policy, has been criticised by serious people as being a mere collection of worst case scenarios designed to scare the public into line. We have seen the Royal Society, yes the Royal Society, which I thought was dedicated to finding the truth through scientific research, seeking to close down the debate in a threatening and outrageous way. The Royal Society is happy to talk, sinisterly, about climate change deniers. But the reality is that governments are convinced and are starting to hatch plans to curb CO2. Britain’s Committee on Climate Change, in a report, recommended to the government ways to cut CO2 emissions by 80 per cent by 2050. On the BBC’s flagship current affairs programme ”Newsnight”, a discussion group to discuss this included Lord Adair, author of the report, a representative of the power generation industry, and ”environmentalist” George Monbiot. Discussing measures which would seriously impoverish the British economy, but have no discernable impact on the climate, the talk was all about how to meet the CO2 objects. Not a word on the distinct possibility that the whole process was pointless. This is typical of the BBC, and much of the western media. In Britain, all the main political parties have signed up to agree that we are causing global warming, so debate has effectively been stopped. Bjorn Lomberg, author of ”The Skeptical Environmentalist” and ”Cool It”, said the committee’s recommendations would be a very expensive way to achieve almost nothing. Lomborg does believe that humans are impacting the climate. Christopher Booker, fearless iconoclast and author of ”Scared to Death”, doesn’t. In an article in the Sunday Telegraph headed ”President-elect proposes economic suicide for US”, Booker talked about the conventional wisdom of CO2’s impact on climate as ”claims so demonstrably fallacious that they amount to a string of self-deluding lies”. Obama has also signed up to cut 80 per cent of CO2 in the U.S. by 2050. ”(this) could only be achieved by closing down a large part of the U.S. economy,” Booker said. ”He (Obama) then babbles on about generating five million new green jobs. This will presumably consist of hiring millions of Americans to generate power by running on treadmills, to replace all those ”dirty” coal-fired power stations which currently supply the U.S. with half its electricity,” Booker said. There is of course a sensible course of action which could go some way to uniting these opposing views. Those who point out the weakness in the arguments put forward by the IPCC, and its supporters, would surely agree that fossil fuel based energy will run out sooner or later, that massive research funds should be committed to finding a suitable replacement, and that meanwhile coal, oil and gas should be treated in a suitably respectful way, with taxation seeking to force its economic use. But we don’t need to flagellate ourselves in the meantime back into the Stone Age, as the likes of George Monbiot would have us do. Red State, a U.S. conservative blog-site has an interesting article by Robert L Mayo which I think puts the argument perfectly. ”When scientists who believe in global warming stop calling colleagues who disagree with them ”Flat-Earthers” and ”Neanderthals”, or insist that ”the debate is over” and therefore it is illegitimate to question them, then I may be willing to listen to their arguments. Not until then,” Mayo said. Idag den 11 december så är den SAMLADE EFFEKTEN FRÅN DE SVENSKA VINDKRAFTVERKEN NERE PÅ 3 %. En minskning med 50% på en dag. Efter att ha minskat med DRYGT 67 % dagen innan. Vad kan man säga om detta vansinne! De ekonomiska realiteterna vad det gället hela Global Warming Hysterin börjar gå upp för allt fler politiker ute i Europa. Och vanligt folk har börjat protestera. Här en utmärkt artikel från gårdagens Wall Street Journal om det ekonomiska vansinnet med handeln med utsläppsrätter. In Brussels last week, some 11,000 metal workers clogged the EU quarter to protest global-warming policies. They worry that their industry could be harmed and their jobs forced overseas; some of them carried coffins as props. Most of the marching workers were from Germany, where auto makers are also still fuming over new emissions standards. Audi and BMW and other carbon-using industries have argued both for shallower emissions cuts and a longer phase-in period. No wonder, then, that the Europeans are delighted over the pledges by the incoming Obama Administration and Democrats in Congress to adopt similar legislation to tax U.S. industries. The EU members may differ on their own limits. But they all agree that the U.S. should ”show leadership” by committing to meet the same target they’re setting for themselves — reducing emissions by 20% to 30% below 1990 levels by 2020. Never mind that most European countries aren’t close to meeting their Kyoto goals, and in all likelihood will fall short of any new targets. The point is to impose those same burdens on the Yanks. China and India, two of the globe’s biggest carbon emitters, have even called Mr. Obama’s goals for combating climate change ”inadequate” and have advised the U.S. to speed up its time table for carbon reductions. And why not? They would be first in line to gobble up the jobs and production lines that the U.S. would lose if energy costs rise sharply in America. We hope the incoming Obama economics team is paying attention to the worker and industry backlash in Europe. Mr. Obama is still embracing the line from Greenpeace and the Environmental Defense Fund that cap and trade can generate five million ”green jobs.” If you throw enough tax subsidies at something, you’re bound to get some new jobs. But if the money for those subsidies comes from higher energy taxes — and a cap and trade regime would amount to as much $1.2 trillion of new taxes — millions of jobs in carbon-using industry are also going to be lost. The Europeans once believed the ”green jobs” myth too. Now, as blue-collar workers take to the streets, they have learned that climate-change legislation means green unemployment. Idag den 7 december så är den SAMLADE EFFEKTEN FRÅN DE SVENSKA VINDKRAFTVERKEN 9 %. Det är alltså detta MYCKET DYRA, OSÄKRA och MYCKET SUBVENTIONERADE energislag som skall ”rädda” vår energiförsörjning. Och bergochdalbanan fortsätter oförminskat med allt LÄGRE EFFEKT lagom nu till vintern. När vi behöver ALL elektricitet och värme vi kan få. Våra intälägänta politiker vill satsa enorma summor via skatter och bidrag på ett energislag som ger 9% effekt när vi behöver 100% FRÅN ALLA ENERGISLAG. Of 30 October anomalies, it ranks 30th. Yes, that is correct. It was the coldest month since at least 1979, when the satellite data started. We can fit a positive trend line going back to a starting point in most periods from a starting point of April 1981 to January 2000. The longest term trend lines are negative and the shorter trend lines are negative. Warren Meyer, has just posted this approximately one-hour presentation which he gave at the California Regional Council of Rural Counties at South Lake Tahoe in September, 2008. The problem is that the YouTube crushes the resolution so many of the charts is hard to read so for these see the PowerPoint file.